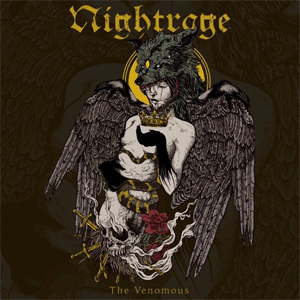 NIGHTRAGE Premieres New Video, "The Venomous"
Greek/Swedish metallers NIGHTRAGE have released their new single, "The Venomous" via Despotz Records and have launched a corresponding video for the track that you can watch on KNAC.COM right HERE. "The Venomous" tells a tale of extinction: dealing with the failure of mankind and how we as human beings are racing towards our own demise. The track comes from the album of the same name (released 31 March via Despotz Records) and introduces two new members to the fold: Magnus So¨derman (guitars) and drummer, Lawrence Dinamarca, who join Marios Iliopoulos (guitars), Ronnie Nyman (vocals) and Anders Hammer (bass). NIGHTRAGE was formed in 2000 by Greek guitar hero Gus G. (OZZY OSBOURNE, FIREWIND, etc) and rhythm guitarist Marios Iliopoulos (DIES IRAE, EXHUMATION), undergoing a number of changes along the way, including Jo Nunez (FIREWIND), Per Moller Jensen (THE HAUNTED), Nicholas Barker (CRADLE OF FILTH, TESTAMENT, etc) and Bill Hudson (KOBRA AND THE LOTUS, TSO), amongst others. Releasing their first album, Sweet Vengeance in 2003 via Century Media Records, the band has gone on to release a further five albums, with their last effort, The Puritan being their debut for Despotz. "The Venomous" can be purchased HERE.